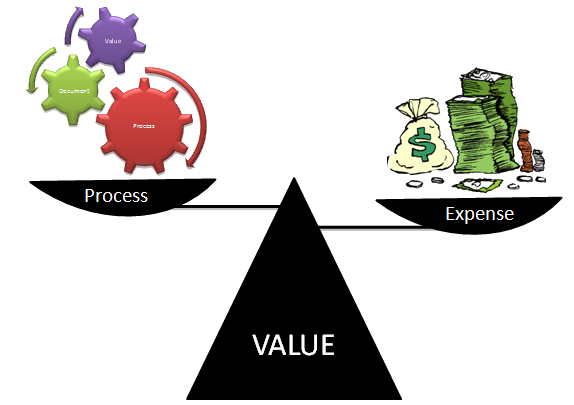 I've been in a few conversations recently about "overhead' processes, and my favorite topic - adding value. I'm going to provide a few examples of what I consider rightsizing processes. These processes should be implemented judiciously and appropriately to deliver the information and results needed to add value and deliver your projects on time. Project Management - I cannot stress the importance of tracking projects at an appropriate level to create a critical path for developing and managing the timeline. My experience is that this is as much of an art as a science. The science is in the methodology, the art is in the understanding and ability to identify dependencies and timing accurately. Time tracking - I've posted about this previously. Track sufficient information using appropriate granularity to support your project schedules, accounting for resource time in a broad sense by service and category. Right size this so you do not expend valuable project and service resources recording unnecessary information. Tracking information that is not useful for improving project management, increasing support for the service, or fulfilling sponsor reporting requirements is frustrating for staff and wastes precious resources. Disaster Recovery / Business Continuity Planning - Nobody ever expects a disaster to occur. However, they do... and it is too late when you realize that the one person with the knowledge to recover your enterprise service just took off in a plane destined for a remote village half-way around the world. Cross Training - Cross train your staff, and document basic operational requirements. They may complain about the additional work. However, when they discover that this enables them to take vacations without being tethered to a work device, they will thank you. Change Management - Do an appropriate level of planning and documentation of changes, and incorporate this into your processes to support audit requirements and aid in identification of causal effects. Manage change so that risk is minimized, and recovery from change can be reverted without a significant amount of effort. Incident Reports - these are extremely helpful in developing an understanding of impact, and causal effects when something significant goes awry. Reflection and openness are necessary to change processes and mitigate future risk. Again, do not spend five days documenting an incident that was minor - and that only merits minimal documentation of the issue, impacts, and lessons learned to help reduce future risk and improve recovery. There are times when risks must be accepted, and that's okay as long as the risk and potential impact has been mitigated to an acceptable level. Our greatest failures can provide the best learning opportunities. Meetings - maximize efficiency by preparing for the meeting, and having a clear agenda. Document follow-up items, delivery dates, and ownership. Not preparing leads to wasted time. Having nine people wait for ten minutes for the tenth person wastes 90 minute of productivity that cannot be recovered. Preparation should be appropriate for the topic and audience. Communications - Appropriate levels of communications are critical. Too little communication, and your stakeholders are uninformed and can become unpleasantly surprised. Too much communication and your messages are ignored. Work with your stakeholders and staff to establish a level of communications that is appropriate. The most important part of this is collaborate with your team and stakeholders to define a level of process that is consistent and appropriate. Be inclusive and transparent in the discussion, accepting and acknowledging feedback to develop processes that improve overall efficiency. Most importantly, evolve your processes to continually become more efficient. Perfection is often something we cannot afford in our lives. The sooner we acknowledge this, the more efficient and effective we become. Be a good steward of your resources, and strive for customer satisfaction and good stewardship. If your services are not affordable, you will not be in business or servicing your customers for any length of time. That's it for this post... until next time... lead and manage for success!